This shop has been compensated by Collective Bias, Inc. and its advertiser. All opinions are mine alone. #DipintoMeze #CollectiveBias It’s time for some patriotic table decor. We’ve all had that moment when our friends or parents decide to visit with no notice for an important weekend. But don’t panic. Just because you have little warning that you’ll be having guests for Memorial Day weekend, doesn’t mean that your table decor has to suffer. 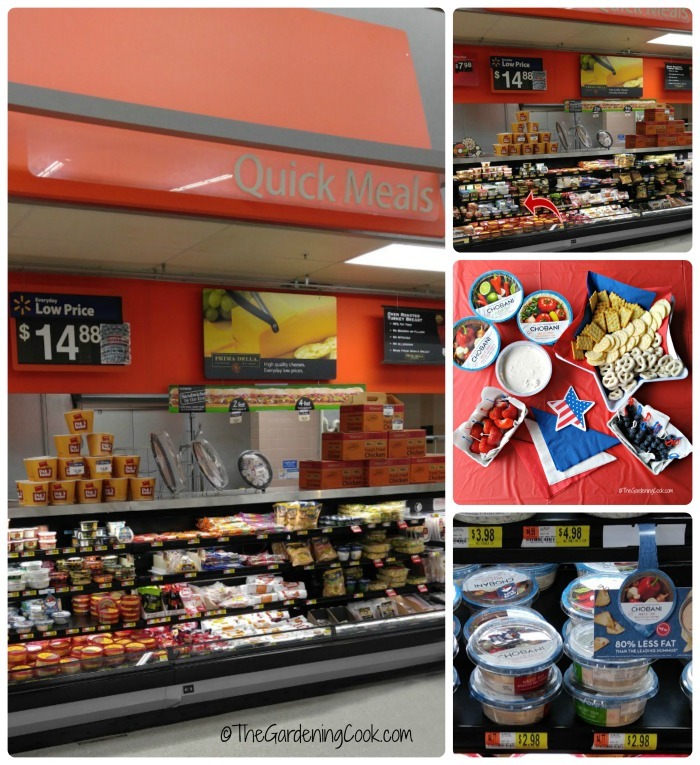 I have put together a group of patriotic table decor ideas that can be done on a budget and in no time at all. They are perfect for both Memorial Day and the upcoming Fourth of July! Get your Memorial Day or Fourth of July entertaining going in style with these patriotic table decor ideas. I always have supplies in my craft room that can be re-purposed year after year to use on my entertaining tables. So, when I know that I will be having guests with very little notice, I can scrounge around in my supplies, and put something together quickly. If I don’t have what I need, a quick shopping trip will give me what I can use for both decor and food supplies that can be put together in a flash, as long as I don’t try to overdo things. The key to staying relaxed at times like these is to not try to be superwoman. Keep both the decor and food ideas simple and you’ll be ready for a great looking party table in a calm mood. Remember, not everything single thing has to be homemade with 15,000 ingredients. 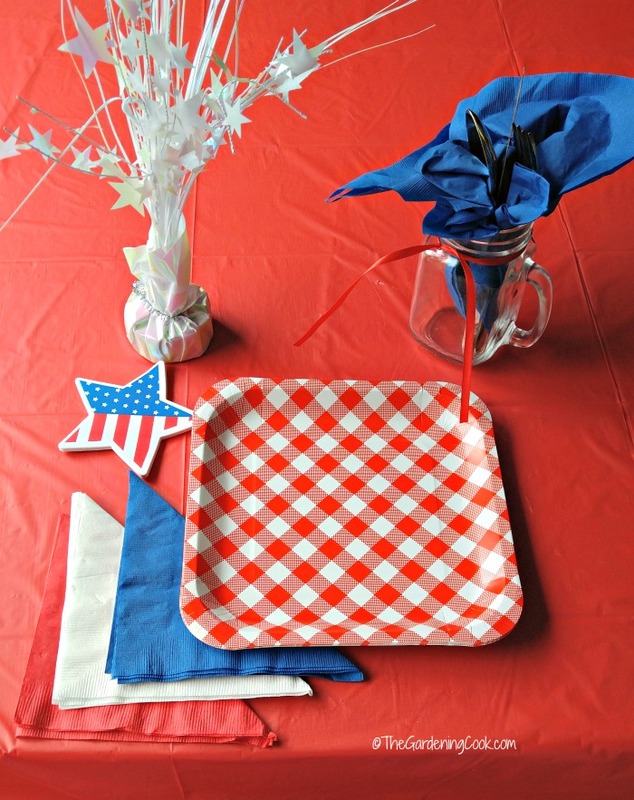 When it comes to making patriotic table decor, it helps to keep supplies of red, white and blue items on hand. They don’t always have to be used together. Red napkins are perfect for Christmas and Cinco de Mayo. Blue supplies are great for pool parties. And white is the perfect choice for many occasions. But put the colors together and you have a patriotic table waiting to happen. I’ll start my patriotic table decor with a plain red table cloth. It gives a colorful base to the tablescape and makes everything else pop. Now, let’s get this party going! 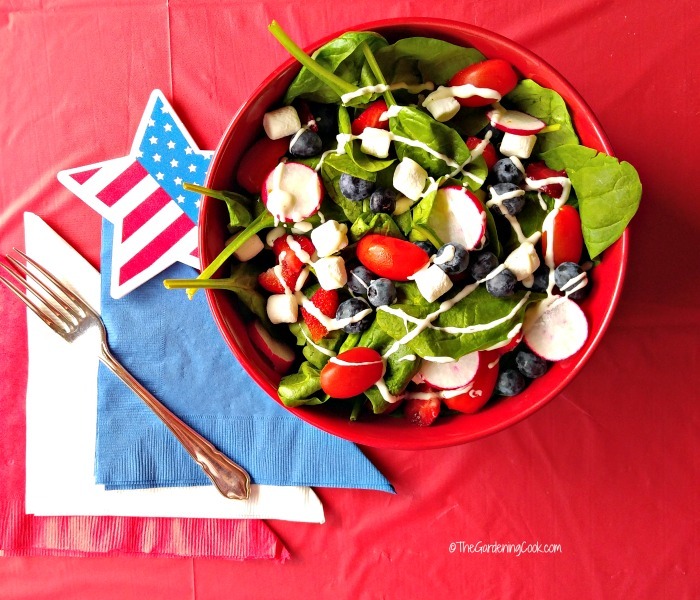 You’ll be amazed how quickly this patriotic tablescape comes together! 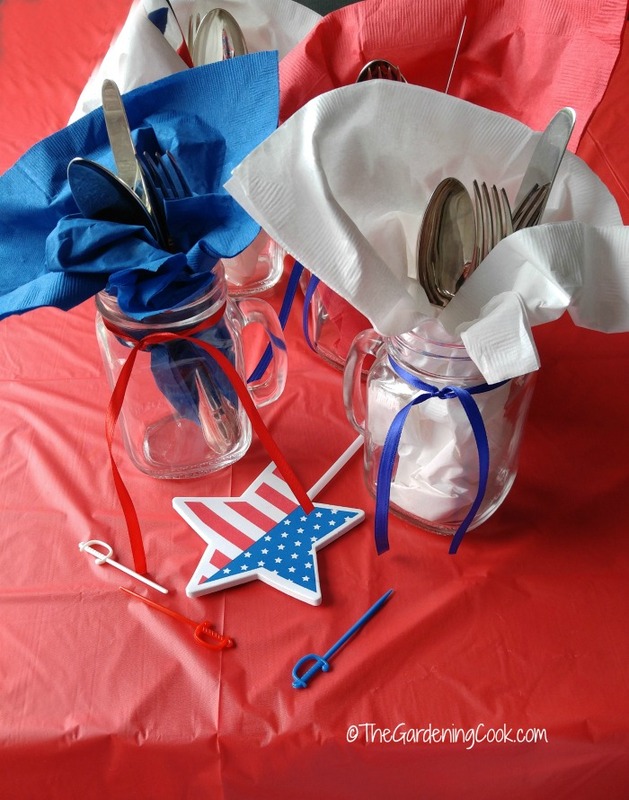 Mason jars lined with red, white and blue paper napkins hold a setting of cutlery for each guest. The whole thing does triple duty and gives each guest their own drinking vessel as well as both the napkin and silverware they will be using. Tie on some red and blue satin ribbon and they are good to go. They are assembled in a flash and really look great on the table! Some of the simplest decor ideas can be used over and over again. These red checked paper plates and this star table decoration are going to be used for a kid’s overnight camping party that I’ll be hosting soon. They look perfect on this table and will have a completely different look for my next party. Who would have ever thought that supplies for a camping party would be the same as those for a patriotic table? Well, they are…and that is the key to easy decor. 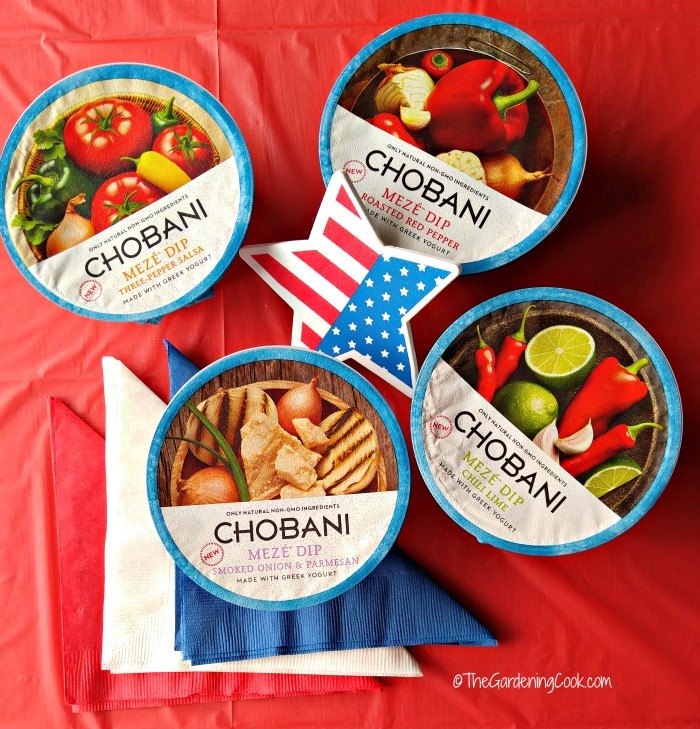 Since the Chobani Meze Dips are Mediterranean inspired, and Mediterraneans love healthy foods, I wanted to incorporate lots of fruits and vegetables in my party plan too. Now comes the question about how to pair them. Easy! Since red, white and blue is the theme for my table, I chose fresh strawberries, fresh blueberries and yogurt covered pretzels. 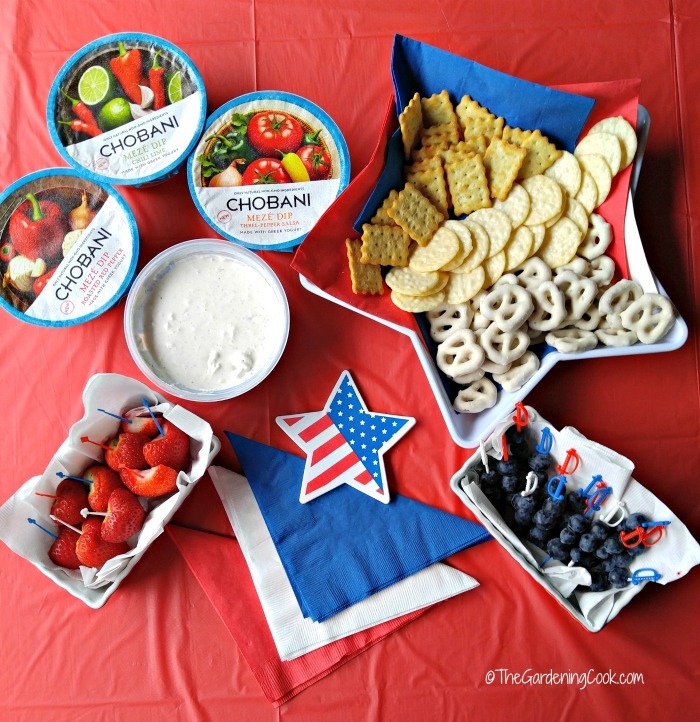 Small red, white and blue appetizer picks hold the berries together to make for easy dipping. An assortment of crackers complete the platter. I used my paper napkins to line an inexpensive star shaped dish to hold my crackers and pretzels to keep the patriotic theme going throughout. Not just the accents for my patriotic table decor are crafty items. I brought the food into play too. Since I already have the berries on hand, and always have salad ingredients in my fridge, a patriotic fruit and spinach salad with a few mini marshmallows, sliced radishes, baby tomatoes, strawberries, blueberries and a white Ranch dressing gives me the colors I want and keeps to my healthy dinner plan. It will go perfectly with any meat that you have to cook on the grill. Also, the salad is very fast to make and that is what today’s entertaining is all about. 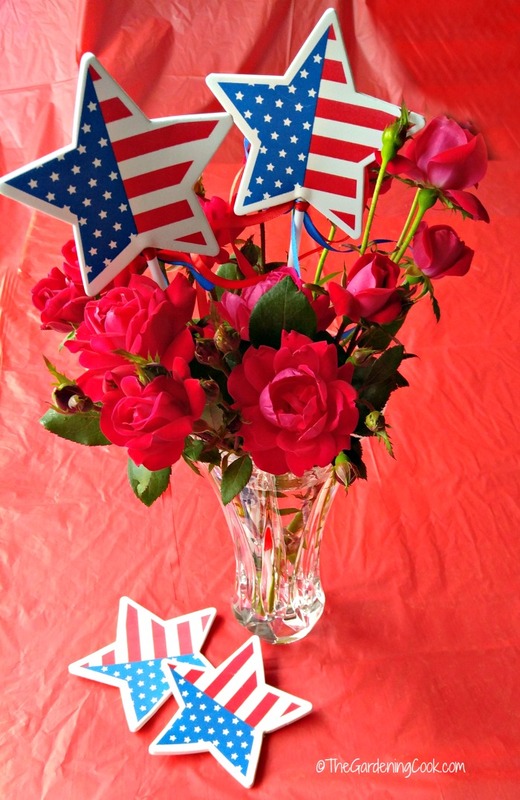 Rounding out my patriotic table decor are some flowers. My garden is just starting to flower right now and, as luck would have it, the rose bushes that I trimmed a few weeks ago are just starting to bloom. I placed a couple of colorful patriotic stars in the vase with the roses, and the table decor is really coming together. 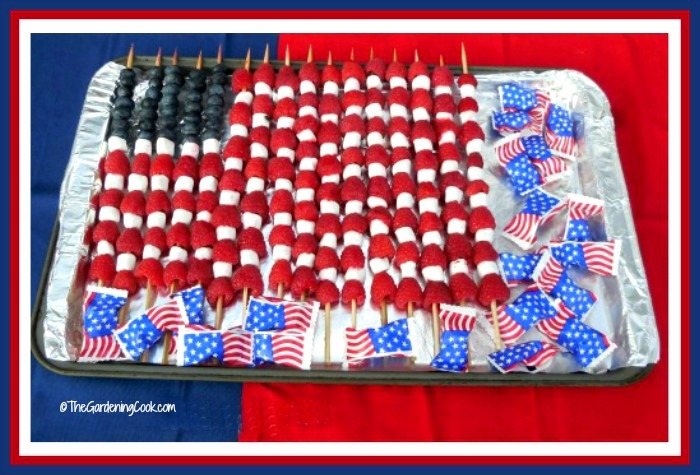 Dessert is a patriotic fruit flag made on bamboo skewers with blueberries, raspberries and mini marshmallows. A few patriotic after dinner mints give an extra sweet taste, too, to round out the meal. This fruit flag is so simple to make and ties together the whole meal and is the perfect patriotic ending. You can see the tutorial for this fruit flag here. Finish up by setting everything out on a patio table, and you are ready to entertain. Now it is your turn – What do you have in your craft room that you can re-purpose for some patriotic table decor? Don’t forget the most important tip – have fun with it all. This weekend is made for entertaining and enjoying your guests, not stressing about your party table! I can’t wait until my guests arrive! For more ideas about holiday entertaining, be sure to visit my holiday site – Always the Holidays. Glad you liked it Lori. I had a ball putting it together and the dips are AMAZING…seriously good. Great ideas, Carol. Although I’m not in the US I can make something similar – and the food is universal! The Patriotic table decor looks great! Love the idea of putting the silverware/plastic ware, and napkins in the mugs. The bamboo skewers with the berries are really neat, and the dips look yummy! I’m a chip and dip addict ? These are truly some of the best dips I have ever had. Only 25 calories for 2 tbsp too!